Wonderfully appointed contemporary villa comprising the main villa and two adjoining studios on a lower level. Set high on a hillside overlooking the bay of Porto Vecchio. There is a good sized private swimming pool with a large terrace commanding stunning views of the sea and the mountains beyond. Within walking distance, down the hill, is one of the islands best-reputed restaurants and the nearest beach 800 metres (although this tends not to be the one holidaymakers to the villa used as nearby Palombaggio is much better). 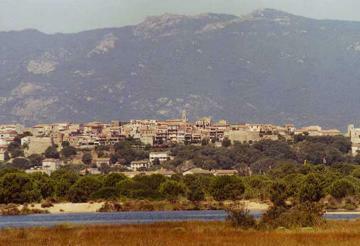 Porto Vecchio, which has lots of restaurants and shops including two hypermarkets is within easy driving distance 3.5km. Figari airport 22km. Bastia airport 128km. There are few villas on the island with views to match Lea. The fabulous Palombaggio beach is 4km along the coast and is the beach Lea clients generally use. Sperone 18 hole golf course 28km. The pool floor level comprises a double bedroom (1 x 160cm wide bed) with en-suite shower room with toilet. Double bedroom (1 x 140cm wide bed) and a twin bedroom (2 x 90cm wide beds), each with patio doors to terrace. Bathroom with over-bath shower and twin sinks. Toilet and a laundry room. Large fully equipped kitchen with access to covered, poolside terrace and built in barbeque area. Spacious, split level living and dining room with snug and fireplace and access to the terrace overlooking the sea and the pool. Stairs to a reading gallery. Ground floor first studio (independent access) comprises a family bedroom (1 x 140cm wide bed and 1 x 90cm wide bed). Shower room with toilet. Open-plan kitchen, living and dining room with double sofa bed (140cm wide) and access to patio with sea views. Ground floor second studio (independent access) comprises a double bedroom (1 x 140cm wide bed) and a shower room with toilet. Open-plan kitchen, living and dining room with double sofa bed (140cm wide) and access to covered patio with sea views. The decor is very attractive and incorporates pleasant colours whilst furnishings are a mix of modern and traditional. The villa and studios are always rented together and are not available individually, there is air conditioning in each area and in all the bedrooms. The garden is mainly terraced with areas in front of the studios then steps up to the main pool terrace, all have fabulous sea views. This is a tranquil spot. Refundable deposit payable locally 800€ cash and credit card details retained for deduction of up to 1200€ if required. Obligatory final clean 250€ payable locally. Linen hire is payable locally 120€ (request in advance). Tax de Sejour payable locally - varies between 0.3 and 1 euro per person per night. Heating for the house and firewood. Air conditioning use is payable locally. Additional services (where available) including cleaning, babysitting and cooking.